Nice to Meet You. Hi from Dropstone Outfitting. Hi from Montana. 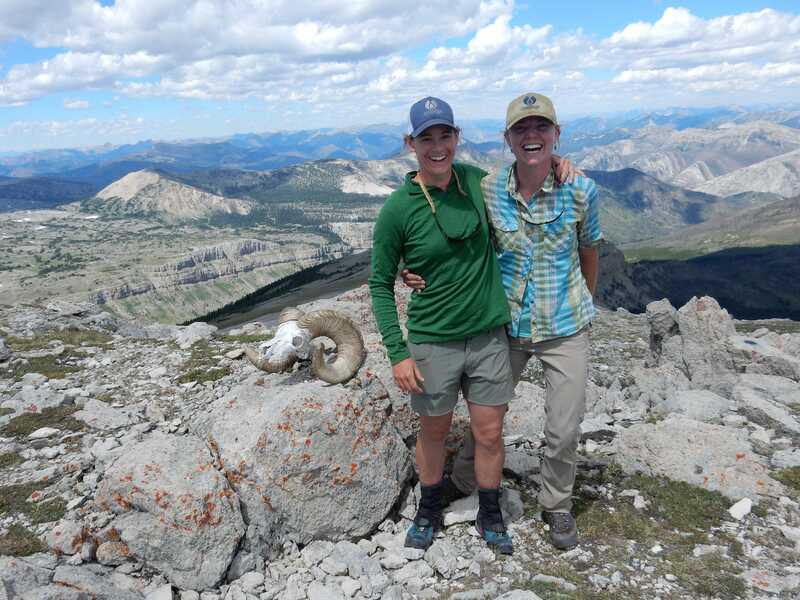 We’re Yve Bardwell and Maggie Carr, co-owners of Dropstone Outfitting in northcentral Montana. Maggie and I grew up in the area, working for various guest ranches, ranches, and the U.S. Forest Service. We share a strong affinity for the Rocky Mountain Front and The Bob, and we take pride in providing quality backcountry trips. We feel fortunate that we’re able to share this landscape with others. That Dropstone Outfitting ever happened is still surprising. We were both in Choteau, a place we loved, and had been working a variety of seasonal jobs. As one may imagine, finding permanent work in a small, rural community can be tough, and we were realistic enough to realize that if anything was going to happen we would have to come up with it ourselves. Turns out we had the same answer: take people into the mountains. We had a lot of collective experience doing this sort of thing. Maggie had spent several seasons working for the Forest Service, roving around with a pack string, clearing trails and guiding guests on horseback, while providing interpretive discourse about the surroundings. I’d done quite a bit of field science in the backcountry with a horse, mule and dog, and I worked for an outfitter on the Missouri guiding canoe trips through the Wild and Scenic River. I don’t recall how the idea was spawned to do stock-supported hiking, but I liked to hike and Maggie liked to pack, so the two notions worked well together. It came to Maggie’s attention that there was already a couple in Choteau doing that exact thing. We just happened to know them, too. In 1973, Bill and Polly Cunningham started High Country Adventures, the first backpacking-centric outfitting business in the country, and they had been taking people hiking and backpacking all over The Bob each summer since then. At this point, the Cunninghams were both semi-retired, and we thought we might approach them about helping out with some of the packing work, which was done by hired contractors. This was around 2011. After Maggie assisted on a few trips, we asked about contracting under their permit to run one of our own in 2012, just to see if we even liked it. That’s how “Yoga in the Scapegoat Wilderness” came together. As fires popped up, we had to change the route and ended up in the Teton, but the trip was a blast even if it was cobbled together. We made $35. We had fun, the guests had fun, and the trip was in the black. We chalked it up as a success and hoped that Bill and Polly might let us do it a few more times. That fall they offered to sell us their business. In January 2013, we bought the business. It has been a steep learning curve and a labor of love. However, I can’t really tell our story without saying what an amazing community endeavor it has been. We’ve needed plenty of help along the way and have always received amazing support: from our fellow outfitters, family, friends, and especially guests. It doesn’t take long on one of our trips to realize how many different people are involved in making it all come together. I think this is the main reason we have been successful. I would also like to acknowledge that we are a female-owned business and give a nod to all the ladies who have come out on our trips. We learn a lot from our guests, but it’s always humbling to hear from other women about how proud they are of us for achieving what we have. Honestly, although we have met with challenges unique to being female, we have never felt disadvantaged because of our gender. We’ve just had to do things our own way, and it has been inspiring to meet the people who have made that possible. So thank you. We hope to do our bit in conservation and strive to share the democratic experience of spending time on public lands. It truly is a privilege. So. . . What is a dropstone? Many people ask us how we came up with our business name. A dropstone is a geologic term for a glacial erratic. A glacial erratic is a large, misplaced rock on the landscape. The Rocky Mountain West was once home to several large glaciers and these glaciers pushed far out onto the plains. As they receded, they left behind debris (dropstones) transported from other locations. Along The Front, you will often see large boulders sitting out in the middle of the prairie; this is a dropstone.